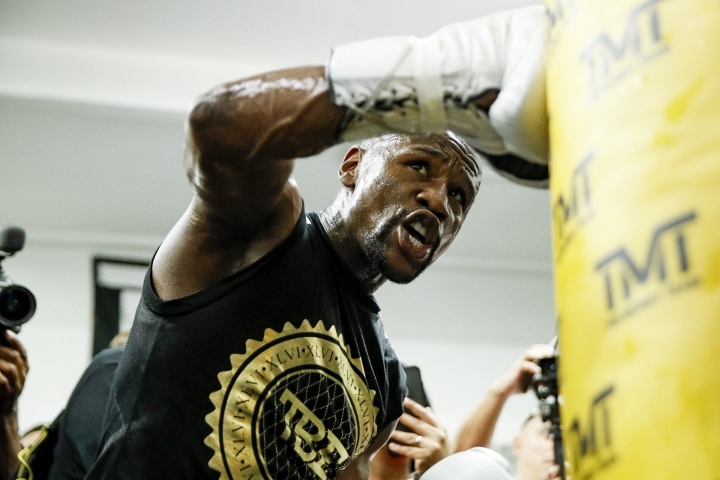 Floyd "Money" Mayweather opened up the Mayweather Boxing Club on Thursday for a media workout ahead of his highly anticipated matchup against UFC champion Conor McGregor on Saturday, Aug. 26 in the headlining attraction of a SHOWTIME PPV event from T-Mobile Arena in Las Vegas. America's youngest world champion, Gervonta "Tank" Davis will make the second defense of his world title against unbeaten challenger Francisco Fonseca while former world champion Badou Jack "The Ripper" is set to challenge 175-pound titleholder Nathan Cleverly in his debut at light heavyweight. The PPV event begins at 9 p.m. ET/6 p.m. PT with undefeated rising cruiserweight contender Andrew "The Beast" Tabiti taking ontwo-time world champion Steve "U.S.S." Cunningham in a 10-round bout. Tags: video Mayweather vs. McGregor Conor McGregor Floyd Mayweather Jr.